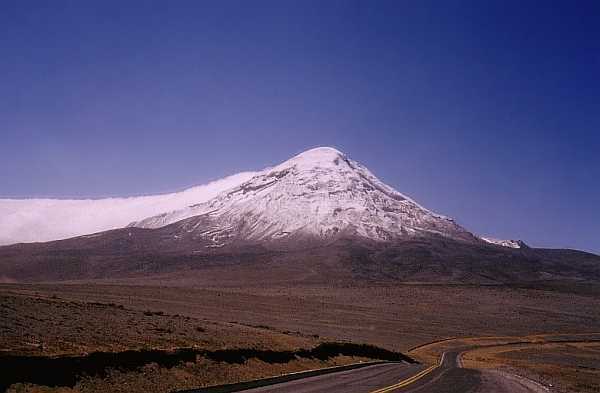 The Chimborazo, 6310 m, highest mountain of Ecuador and, as all mountain books stress, due to the proximity of the equator, the nearest point on earth to the sun. There have been paraglider flights from the summit already. 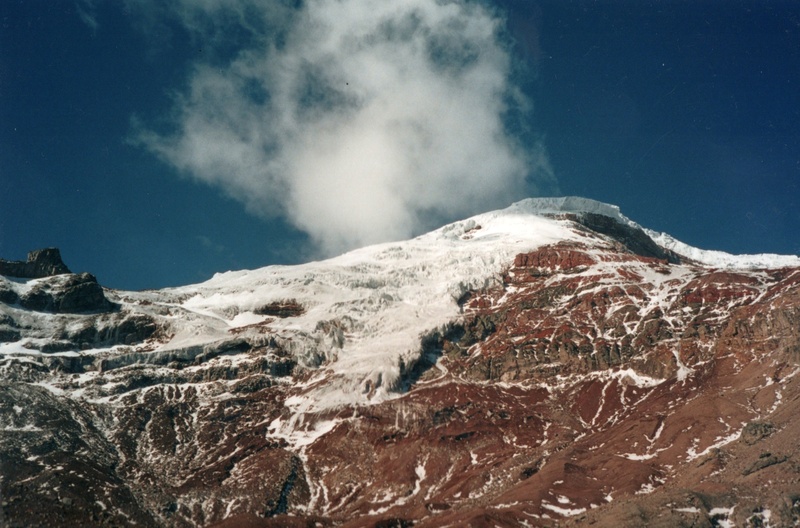 Trip to Chimborazo in the middle of July 2003. Hiking around it, climbing it and flying from 5100 m below the glacier edge to the high plain at 4700 m, no flight photos taken. Nice launch at hill near the glacier directly above the hut. Sufficient landing possibilities, wind conditions however fastidious, which is why the flight in the leeward side of the mountain was rather short. Approaching the mountain. 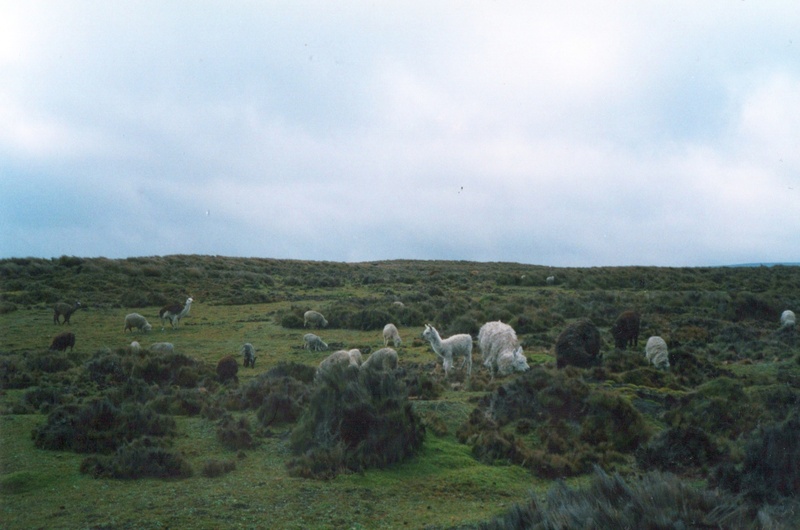 Lamas, alpakas, and sheep in the high plain northwest of the Chimborazo. 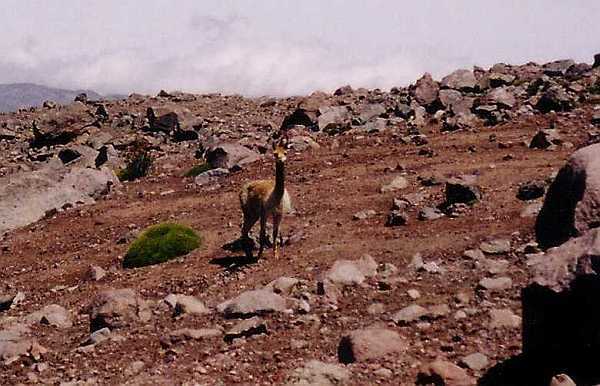 A beautiful walk leads From the pass road between Ambato and Guaranda down to the valley of Riobamba, passing between Carihuairazo, (Cari = man, huaira = wind, rasu = snow (quech.) 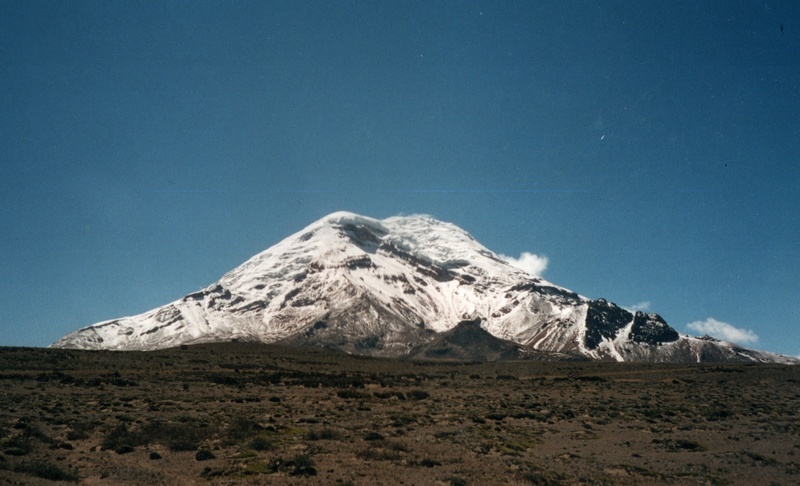 and Chimborazo. A nice approach to this majestic ice block. The Indigeneous there still live in the traditional, small Ichu grass huts. A hard, poor life. Here is the bad weather side of the mountain. Much fog, much rain and a snow, which thaws away at noon time and leaves a little swamps behind. By foot half around the mountain, in order to become acquainted with its many faces. 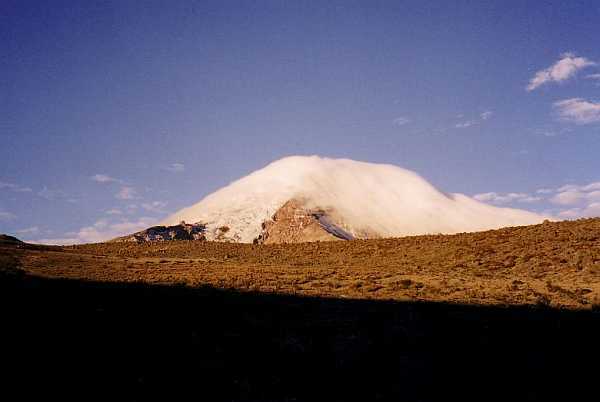 Clearly visibly, how the wind pushes the northern clouds against the Chimborazo, which leads to the moist, windy climate there. The southern side however is well shielded by the mountain and is, although only a few km away, desertlike dry. It must be taken into account during the flight, that the northern winds, after blowing around the volcanic cone, meet again in the high plain and cause violent turbulences there. Even if the wheather is completely calm at the hut, which is situated in the leeward side, there may be strong air currents further below. If the wind drives the clouds beyond the summit to the south and the slopes down again, the Chimborazo looks like a cake covered with icing. Unpleasant time for climbing with winds of 200 km/h and more, but that can change again within a few hours. Hundreds of crosses at the foot of the mountain show, how many mountaineers have been surprised by the abrupt wheather changes. In this picture the left third of the mountain silhouette is the ascent side. Despite the tempest at the summit this side is mostly well protected. Vikuñas on one of the few green spots in the southern high plain around the Chimborazo. A gift of the Chilean government, whose preservation is supervised and expensively paid by the State of Ecuador. 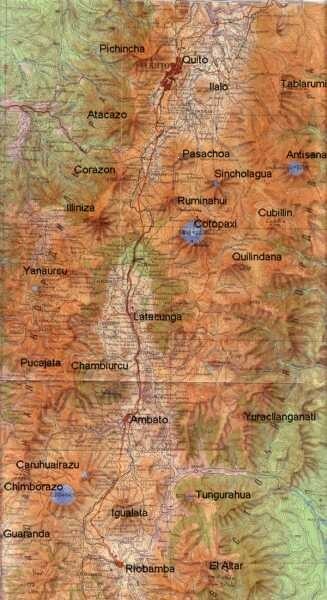 It is the only area of Ecuador, where they have remained. 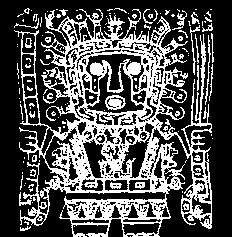 Chronicles say that the the only one that was allowed to wear clothing made of vikuña wool, was the Inka himself. 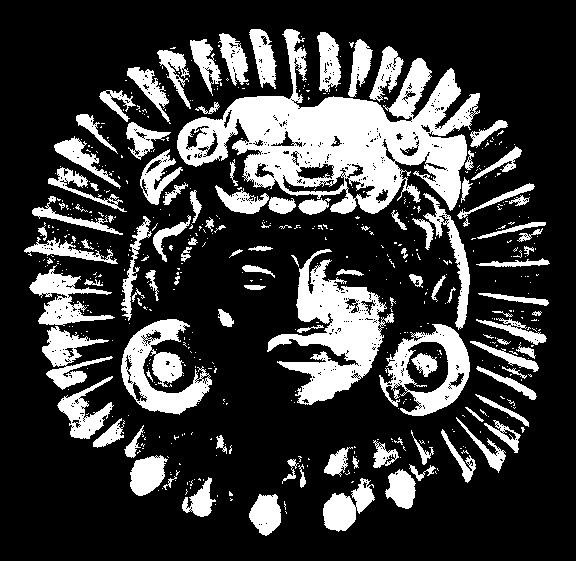 Each day a new shirt, artfully woven, while the old one was burned immediately. On the way downward by paraglider, I flew closely over the herd of these graceful creatures. They all turned their heads with their beautiful eyes up towards me. Further approach. The Whymper hut, a refuge named after the first ascender, lies invisible in a little hollow straight ahead. To the left of of it, underneath the glacier, the launch for the flight back towards the road. Not visible anymore to the right, at the end of the rock the Whymper needles, nice point of climbing to get used to the height and watching sunsets. From there the route of the first ascender started. Our route, the presently normal ascent route leads from underneath the rock left (Castillo) onto the glacier and from there in a few turns to the left flank and then straightforward to the top. The point below the Castillos, where the glacier equipment is put on in the night becomes dangerous between eight and ten in the morning on the way back due to falling rocks. I took a short rest there at the descent and almost got my head knocked off. 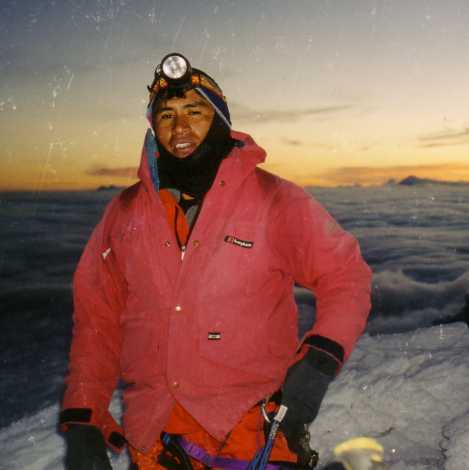 Short before sunrise with Rafael on the summit (Veintimilla). Tour start at 1:00, summit at 6:00 o'clock. 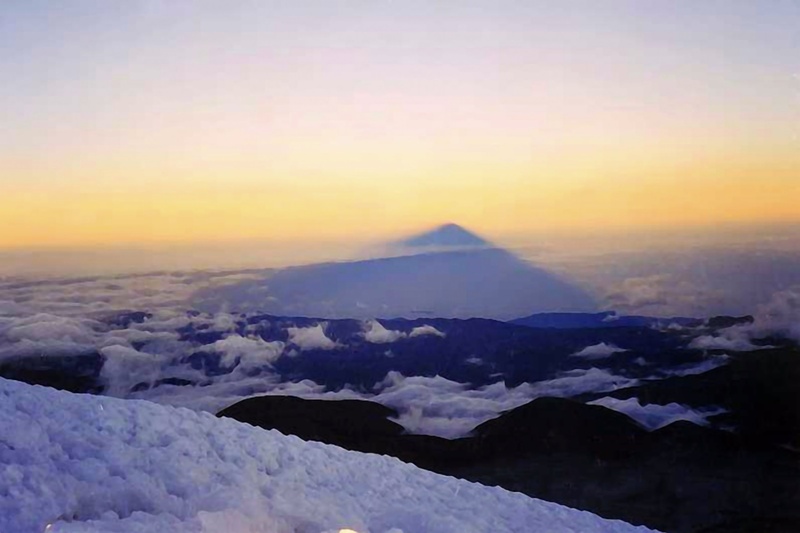 Only Cotopaxi, (center) and the Illinizas, (left) in the north have their noses high enough in the air to gasp for breath above the clouds. The enormous shade thrown to the west. 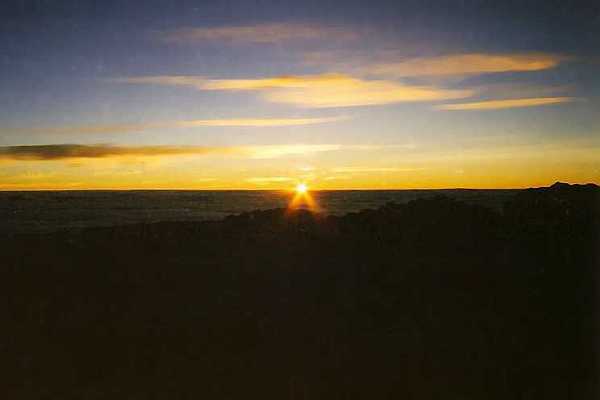 From below the Chimborazo does not appear that conical, but the sun knows better: It is not so much the form of the mountain you observe here in the shadow but the laws of perspective. The long way of the parallel sun beams that project onto the fog and meet at the vanishing point. 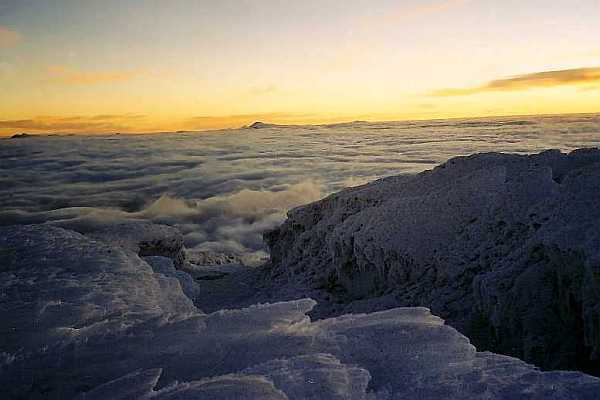 Rafael (Baños, contact henri@aeropasion.net) at the summit of Chimborazo. Back to life. 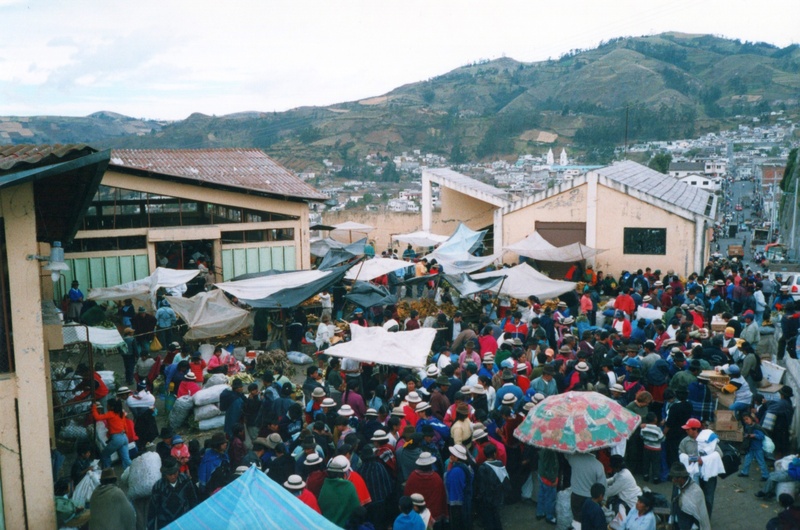 Market in Guaranda, southwest of the mountain in the warm western slopes of the Andes.